French coins play a key role in European numismatics since Middle Ages, due to the Charlemagne monetary reform introduced in 793 which is the turn point between the previous Roman coin system and the modern decimal systems developed after the French Revolution in 1789. The borders of modern France are roughly the same as those of ancient Gaul, which was inhabited by Celtic Gauls. Gaul was conquered by Julius Caesar in 58-51 b.C., and the Gauls eventually adopted Roman speech (Latin, which evolved into the French language) and Roman culture. Lugdunum (Lyons) was the Roman capital. Christianity took root in the 2nd century and 3rd century AD, and became firmly established by the fourth and fifth centuries. 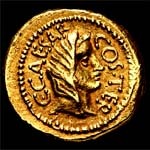 The Roman Coin System adopted during the Julius Caesar era was based on the "aureus" as gold coin (which woths 25 denarius), the "denarius" as silver coin (4.5 g), and the "aes" as bronze coin (which worths 1/10 of the denarius). The internal decline of the Roman Empire invited barbarian incursions. Among the Germanic tribes that descended upon fertile Gaul, the Visigoths, Franks, and Burgundii were the most important. In 486 the Franks, under Clovis I, routed Syagrius, last Roman governor of Gaul. Clovis, who had made himself ruler of all the Franks, founded the dynasty of the Merovingians, but he failed to provide for the unity of Gaul when, as was customary, he divided his lands among his sons at his death. A new dynasty, the Carolingians, had come to rule Austrasia as mayors of the palace in the name of the decadent Merovingian kings, and had united Austrasia with Neustria in 687. In 732, the Carolingian Charles Martel decisively defeated the Saracens between Poitiers and Tours. His son, Pepin the Short, dethroned the last Merovingian in 751 and proclaimed himself king with the sanction of the pope. Pepin’s son was Charlemagne. Crowned emperor of the West in 800, Charlemagne expanded his lands by conquest. He gave his subjects an efficient administration, created an admirable legal system, and labored for the rebirth of learning, piety, and the arts. 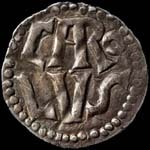 During the Kingdom of Charlemagne, a new monetary system was adopted, based on the silver pound of 409 g, using as fractions the sou (1/20 of pound) and the denier (1/12 of sou). Charlemagne's son, Emperor Louis I, could not maintain the empire he inherited. At Louis’s death (840), his three sons were fighting each other. In 843 the brothers, Charles II (Charles the Bald), king of the West Franks, Louis the German, and Emperor Lothair I, redivided their territories in the Treaty of Verdun. Charles was recognized as the ruler of the lands that are now France. The Carolingians had only superficially transcended the economic, social, and political fragmentation of the land. The weakness of central authority was a major reason for the development of feudalism and the manorial system. Raids by Norsemen, beginning in the late 8th cent., contributed to the decline of royal authority; in 885-86, the Norsemen even besieged Paris. When the Carolingian dynasty died out in France, the nobles chose (987) Hugh Capet as king. It is from this date that the history of France as a separate kingdom is generally reckoned. The early Capetians were dukes of Francia, a small territory around Paris, and were without power in the rest of France. Louis VI (reigned 1108-37) and Louis VII (1137-80) gradually extended their domain. In England, French manners and culture also predominated among the nobles because of the Norman Conquest (1066). The fact that the Norman English kings were also French nobles, holding or claiming vast fiefs in France, brought the two nations into centuries of conflict. (Hundred Years War: 1337-1453). The French defeats at Crécy (1346) and Poitiers (1356), the epidemics and the insurrections in 1357-58 plunged France into anarchy and forced John II (1350-64) to accept the humiliating Treaty of Brétigny (1360). In 1360, the franc was introduced by king John II of France. Its name comes from the inscription reading Johannes Dei Gratia Francorum Rex ("Jean by the grace of God King of the French") and its value was set as one "livre tournois" (a money of account). Other francs were minted under Charles V, Henri III and Henri IV of France. In 1428 the English besieged the key city of Orléans. Joan of Arc helped relieve Orléans, rallied the dauphin’s followers, and in 1429 stood by the dauphin’s side as he was crowned at Reims. In 1453 the English lost their last hold on French soil outside Calais. It was left for Louis XI (1461-83) to destroy the power of the last great feudal lords and to incorporate into the royal domain almost all of present France. Under the reigns (1483-1560) of Charles VIII, Louis XII, Francis I, Henry II, and Francis II, France proved its amazing recuperative powers despite the heavy drain imposed on its resources by the Italian Wars (1494-1559). Religious freedom and political security for Protestants were promulgated in the Edict of Nantes (1598), but after Henry’s assassination (1610) by a Catholic fanatic the rights of the Huguenots were steadily reduced. Under his successor, Louis XIII (1610-43), and in the minority of Louis XIV, two great statesmen successively shaped the destiny of the kingdom, Cardinal Richelieu and Cardinal Mazarin. 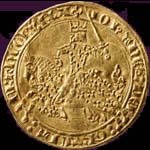 Louis XIII of France stopped minting the franc in 1641 in favor of the gold "louis" and silver "écu", but use of the name "franc" continued in accounting as a synonym for livre tournois. Louis XIV (1643-1715) completed Richelieu’s and Mazarin’s work of centralization. His many wars undermined French finances and his successes in the War of Devolution (1667-68) against Spain and the Dutch War of 1672-78 inspired all Europe with fear of French hegemony and resulted in the diplomatic isolation of France. The reign of Louis XIV saw also the height of French power in America. Louis XV (1715-74) inherited a unified France, but a France still burdened by the remnants of feudalism. The “absolute” power of the king was hedged in by a stupendous multitude of dusty charters and special privileges-often granted to remove the recipients from national politics-held by families, guilds, monopolies, communes, and provinces, and by the clergy and nobles. Taxes, although onerous, were raised inefficiently and inequitably, partly by the farmers general, partly by the state. Commerce, based on mercantilism, was hampered by restrictive regulations, monopolies, and internal tariff barriers. Rural overpopulation outstripped the stagnant agricultural productivity. Colbert had reorganized the administration by curtailing the power of the provincial governors and by reestablishing the administrative units called intendancies, originated by Richelieu. The intendants were trusted civil servants who carried out the policies of the central government, but their capacity to break down local privilege was limited. In several provinces, notably Brittany, the local assemblies of the three estates retained the power to thwart reforms. A more significant stronghold of aristocratic privilege and vested interests was the parlement; the parlements skillfully related their special interests to the still popular ideal of local liberty. The ever-expanding bourgeoisie as well as the large body of landowning farmers, however, were finding the remnants of feudal dues, services, and other customs increasingly intolerable. Economic reform became the rallying cry of the physiocrats and their disciples such as Turgot. Many philosophers of the Enlightenment, notably Voltaire, looked hopefully to the monarchy for administrative rationalization, but the crown’s sporadic attempts at reform, particularly of finances, were hindered by the parlements. Operating under a system of outworn privilege, the wealthiest country in Europe was ruled by a government perennially on the verge of bankruptcy. The honest administration (1726-43) of Cardinal Fleury had barely extricated France from the disastrous failure of the Mississippi Scheme (1720), when Louis XV plunged into the War of the Austrian Succession (1740-48) and the Seven Years War (1756-63). Not only was the treasury drained, but France lost its empire in India and North America. Turgot’s reforms, instituted early in the reign of Louis XVI (1774-92), were cut short in 1776, when he was dismissed. Seeking to avenge its defeat by Britain in the Seven Years War, France supported the American Revolution (1775-83). Financially, however, the war was a disaster for France. In 1788, after neither Calonne nor Loménie de Brienne could get the necessary financial measures enacted, Necker was called back to office to attempt to repair the irreparable, and the States-General were convoked for the first time since 1614. Thus began the upheaval that shook Europe from 1789 to 1815. The States-General were transformed into the National Assembly (1789); a constitutional monarchy was created (1791); war with much of Europe began, accompanied by violence and the growth of radical factions in France (1792); the king and queen were beheaded (1793); Robespierre presided over the Reign of Terror (1793-94) until his own execution. The First Republic is proclaimed on September 21st, 1792 by the Constitution of the Ist year, but it was never put in practice as the power was held by a revolutionary government. The Directory was group of five men who held the executive power in France according to the constitution of the year III (1795) of the French Revolution. They were chosen by the new legislature, by the Council of Five Hundred and the Council of Ancients; each year one director, chosen by lot, was to be replaced. The Directory was balanced by two representative assemblies elected indirectly by property holders. Governing a nearly bankrupt nation, the Directory had a stormy history. Politically, it walked a narrow course between Jacobins on the left and royalists on the right. During its history, the Directory instituted positive monetary reforms, which helped revive trade and agriculture, and provided the basis for Napoleon’s restoration of order. 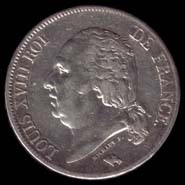 The franc was re-established as the national currency by the French Revolutionary Convention in 1795 as a decimal unit (1 Franc = 100 centimes) of 4.5 g of fine silver (theoretically slightly less than the livre of 4.505 g, though the new coin was set in 1796 at 1.0125 livres (1 livre, 3 deniers), reflecting in part the past minting of sub-standard coin). The Directory not only faced a series of political crises, but was riddled with inefficiency and corruption. It suppressed the conspiracies of “Gracchus” Babeuf on the left and royalist uprisings on the right and later annulled some results in the elections of 1797 and 1798. Its increasingly repressive measures resulted in political isolation and bankruptcy. In the coup of 18 Fructidor (Sept. 4, 1797), the more conservative directors, Lazare Carnot and François de Barthélemy were ousted, and measures against the church and émigrés were revived. In addition, the Directory lost control of foreign policy to the generals in the field, especially Napoleon Bonaparte. Some of Napoleon’s actions, such as negotiating the Treaty of Compo Formio and the Egyptian expedition, may have led to the formation of the Second Coalition against France. Discontent with the Directory rose to a high pitch with the military reverses of 1799 in which the republics from Holland to S Italy fell to the combined assault of Russian, Austrian, and British forces. Despite the fact that an invasion of France was prevented and these forces were defeated before Napoleon’s return, the Abbé Sieyès, elected a director in May, 1799, secretly prepared the coup of 18 Brumaire (Nov. 9, 1799), which put Bonaparte in power, replacing the Directory with the Consulate. The Consulate was a government established after the coup of 18 Brumaire (Nov. 9-10, 1799), which ended the Directory. Three consuls were appointed to rule France: Napoleon Bonaparte, Emmanuel Joseph Sieyès, and Roger Ducos. Sieyès and Ducos were soon replaced by Jean Jacques Régis de Cambacérès and C. F. Lebrun. The Consulate became little more than a scheme for autocratic government by Bonaparte, who was made first consul for life in 1802. 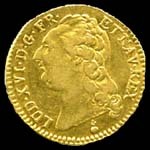 With the creation of a gold franc in 1803, gold and silver-based units circulated interchangeably on the basis of a 1:15.1 ratio between the values of the two metals (bimetallism). Napoleon made himself emperor (1804) and led his armies as far as Moscow. After his defeat at Waterloo (1815) virtually nothing remained for France from the Napoleonic conquests except the basis for a powerful legend. But Napoleonic administration and law left a permanent impact on France. From the ancien régime there reemerged the church (1801 Concordat with the Vatican) and an aristocracy less affluent and shorn of its feudal privileges but still influential. The French Revolution and Napoleon established a uniform, modern administrative system, gave land tenure to the peasants, and left to the bourgeoisie a political heritage that they quickly reclaimed. The Congress of Vienna (1814-15) restored the borders of 1790 and recognized Louis XVIII, brother of King Louis XVI, as France’s legitimate sovereign. The king granted a moderately liberal charter but took France into the reactionary Holy Alliance. Known as the Comte de Provence, he fled (1791) to Koblenz from the French Revolution and intrigued to bring about foreign intervention against the revolutionaries. 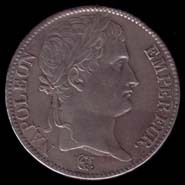 He was recognized as king by the émigrés after the death (1795) of Louis XVII. He passed his exile on the Continent and in England. With the assistance of Charles de Talleyrand, he was restored (1814) to the French throne by the allies after their entry into Paris. He adopted a conciliatory policy toward the former revolutionists and granted a constitutional charter. Forced to flee once more on the news of the return of Napoleon I, he returned with the Holy Alliance (1815) after the defeat at Waterloo had ended Napoleon’s rule of a Hundred Days. His chief ministers Armand Emmanuel, duc de Richelieu, and Élie Decazes were at first moderates, but the ultraroyalists, led by Louis’s brother, the comte d’Artois (later Charles X), triumphed after the assassination (1820) of the count’s son, Charles Ferdinand, duc de Berry. Louis allowed the ultraroyalists to take control. The new ministry headed by the comte de Villèle was thoroughly reactionary. Electoral laws were revised to increase the influence of the wealthy classes, and civil liberties were curbed. 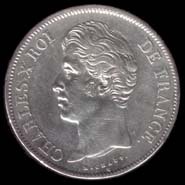 This trend continued and was intensified during the reign (1824-30) of his successor, Charles X. Hundred days is the name given to the period after the return of the deposed French emperor, Napoleon I, from Elba. The Hundred Days are counted from March 20, 1815, when Napoleon arrived in Paris, to June 28, 1815, when Louis XVIII was restored for the second time as king, following Napoleon’s campaign of Waterloo. Louis XVIII's successor, Charles X (1824-30), was the champion of the ultraroyalists. Charles’s efforts to restore absolutism led to the July Revolution of 1830, which enthroned Louis Philippe. 1757-1836, king of France (1824-30); brother of King Louis XVI and of King Louis XVIII, whom he succeeded. As comte d’Artois he headed the reactionary faction at the court of Louis XVI. He left France (July, 1789) at the outbreak of the French Revolution and became a leading spirit of the émigré party. After his failure to aid the Vendée insurrection, he stayed in England until the Bourbon restoration (1814). During the reign of Louis XVIII he headed the ultraroyalist opposition, which triumphed after the assassination (1820) of Charles’s son the duc de Berry. The event caused the fall of the ministry of Élie Decazes and the advent of the comte de Villèle, who continued as chief minister after Charles’s accession. Among the many attempts of Charles and Villèle to reestablish elements of the ancien régime, as the prerevolutionary order is called, the law (1825) indemnifying the émigrés for lands confiscated during the Revolution and measures increasing the power of the clergy met with particular disapproval. The bourgeoisie and the liberal press joined in attacking the Villèle cabinet, which resigned in 1827. Villèle’s successor, the vicomte de Martignac, vainly tried to steer a middle course, and in 1829 Charles appointed an uncompromising reactionary, Jules Armand de Polignac, as chief minister. To divert attention from internal affairs, Polignac initiated the French venture in Algeria. However, his dissolution (March, 1830) of the liberal chamber of deputies and his drastic July Ordinances, establishing rigid control of the press, dissolving the newly elected chamber, and restricting suffrage, resulted in the July Revolution. Charles abdicated in favor of his grandson, the comte de Chambord, and embarked for England. However, the duc d’Orléans, whom Charles had appointed lieutenant general of France, was chosen “king of the French” as Louis Philippe. Known before his accession as Louis Philippe, duc d’Orléans, he joined the army of the French Revolution, but deserted (1793) with Gen. Charles François Dumouriez. Although in exile for the next 20 years, he did not collaborate with France’s enemies. Reconciled with the Bourbons, he returned to France after their restoration and soon recovered his huge fortune. He figured in the liberal opposition to kings Louis XVIII and Charles X and was supported by the discontented upper bourgeoisie and by the liberal journalists. In the July Revolution of 1830, Louis Philippe was made lieutenant general of the realm and, with the support of the marquis de Lafayette, was chosen “king of the French”. His reign, known as the July Monarchy, marked the triumph of the wealthy bourgeoisie and a return to influence of many former Napoleonic officials. Although the constitutional charter of 1814 was revised (1830) in a liberal direction, the new legislature was unresponsive to the economic needs and political desires of the lower classes. In foreign policy, Louis Philippe promoted Anglo-French friendship and supported colonial expansion; Algeria was conquered in his reign. He cooperated with England in support (1831) of Belgian independence and in the Quadruple Alliance of 1834. The Franco-British rapprochement was ended (1846), however, by the Spanish marriages, which violated a previous Franco-British agreement. In France, Louis Philippe became increasingly unpopular. On the right he was opposed by the legitimists (who supported the senior Bourbon line) and by the Bonapartists. The leftist elements organized numerous secret revolutionary societies. The opposition to the government undertook (1847-48) a banquet campaign to propagate the demand for electoral reform. The campaign led to the February Revolution of 1848. Louis Philippe abdicated in favor of his grandson, but a republic was set up. The king fled to England, where he died. Louis Philippe was known as the “citizen king” because of his bourgeois manner and dress, and he and his regime were satirized by Honoré Daumier. In December, 1848, Louis Napoleon Bonaparte, nephew of Napoleon I, was elected president of the Second Republic. In 1852, by a coup, he extended his term and then proclaimed himself emperor as Napoleon III. The temporary government of 1848 (February 24, 1848 - May 6, 1848) was a government of republican tendency intended to manage the French state after the French revolution of 1848, till the election of a new national assembly for a new government. The government decided to make write the new constitution by a constituent assembly, as in 1789 and 1792. This assembly was elected by 7 800 000 French on April 23rd. The constitution of the second Republic is promulgated by the president of the assembly on November 4, 1848. On December 10, Louis-Napoléon Bonaparte is elected president of Republic with 74% of the suffrages expressed. Louis-Napoléon emulated his uncle’s autocratic regime at home and carried on a foreign policy with wars in Russia, Italy, and Mexico. The Second Empire was, however, a period of colonial expansion and of material prosperity. In 1869, Napoleon instituted a more liberal regime with a parliamentary government. But the empire ended disastrously in the Franco-Prussian War (1870-71), in which Alsace and Lorraine were lost to Germany until 1918. After the February Revolution of 1848 Louis Napoleon returned to France. He gathered a following, was elected to the national assembly, and in December, 1848. As president of the Second Republic, he was limited by law to one term. He soon began to strengthen his position and took special care to conciliate the powerful conservative forces. The strong Roman Catholic opposition was allayed by allowing (1849) a French army to restore Pope Pius IX to Rome. After the defeat in the assembly in July, 1851, of a constitutional amendment that would have allowed the president to serve for more than one term, Louis Napoleon began plans for a coup. The masterly coup of December 2, 1851, was largely engineered by Louis Napoleon’s half brother, the duc de Morny. The legislative assembly was dissolved and its meeting place occupied by the army, universal suffrage was established, and a plebiscite authorizing the revision of the constitution was announced. The plebiscite registered overwhelming approval. The new constitution (January, 1852) gave the president dictatorial powers and created a council of state, a senate, and a legislative assembly subservient to the president. In November, 1852, a new plebiscite overwhelmingly approved the establishment of the Second Empire, and Louis Napoleon became Emperor Napoleon III. For eight years he continued to exercise dictatorial rule, tempered by rapid material progress. Railway building was encouraged; the rebuilding of Paris and other cities brought a construction boom. Napoleon’s foreign ventures were successful at first. The Crimean War (1854-56) and the Congress of Paris restored French leadership on the Continent. Napoleon then turned toward Italy. A long-time supporter of Italian nationalism, he met the Sardinian premier Camillo Benso Count of Cavour at Plombières and secretly agreed on a joint campaign by France and Sardinia to expel Austria from Italy and to establish an Italian federation of four states under the presidency of the pope; France was to be compensated with Nice and Savoy. War broke out in 1859. However, after the costly victory of the French and Sardinians at Solferino, Napoleon suddenly deserted his Italian ally and made a separate peace with Austria at Villafranca di Verona. His act was partly motivated by the opposition of the French clerical party to a policy threatening the independence of the papacy at Rome. Having lost much popularity, the emperor inaugurated a more liberal domestic policy, widening the powers of the legislative assembly and lifting many restrictions on civil liberties. Imperialistic expansion was pushed by the French-British expedition (1857-60) against China, the acquisition of Cochin China, and the construction of the Suez Canal. Less fortunate was Napoleon’s intervention (1861-67) in the affairs of Mexico; the French troops finally withdrew upon the demand of the United States, leaving Emperor Maximilian to his fate. The Franco-Prussian War (1870-71) brought ruin to the Second Empire. Napoleon himself took the field, leaving his empress, Eugénie, as regent, but he early devolved his command to Achille Bazaine. He was caught in the disaster of Sedan (September 1, 1870), captured by the Prussians, and declared deposed (September 4) by a bloodless revolution in Paris. Released after the armistice (1871), he went into exile in England. When the Franco-Prussian War began in 1870, France was under the control of Emperor Louis Napoleon III. A National Assembly was based in Paris, but its powers were limited. At the disastrous battle of Sedan, Louis-Napoleon was captured by the Prussian Army, leaving France effectively without a government. When news of Louis-Napoleon's capture reached Paris, leading members of the National Assembly rushed to the Hotel de Ville to declare a new government. At the Hotel de Ville, Léon Gambetta publicly declared the founding of the Government of National Defence on September 4th, and the government immediately assumed control of all affairs in France, intending to continue the war against Prussia. With most of the army captured at Sèdan, the Government of National Defence called almost all military units from across France, including marines, naval units, and troops on foreign service in Rome, Algeria, and Frances' colonial empire, to aid in the defence of Paris before the Prussians reached the city. Having sworn in General Trochu as President, the National Assembly left Paris and relocated to Bordeaux. By September 20th, Paris was completely surrounded and cut off from the rest of unoccupied France. On October 7th, Léon Gambetta left Paris by hot air balloon and arrived in the city of Tours, from which he and his deputy Charles de Freycinet directed the war across unoccupied France. The National Assembly in Bordeaux had very little say in government affairs, as they had no reliable means of contacting Paris and Gambetta did not have time to wait for the Assembly to debate issues. As a result, Gambetta became the virtual dictator of unoccupied France during the war. The government tried to break out twice, once in late November 1870 and once again in mid January 1871. The "Great Sortie", beginning on the night of November 28th, was a disaster. When the Government decided to placate civilian sentiment by using the National Guard in the next sortie of 18th January 1871, the National Guard panicked and fled back into Paris. After the failure of the January 18th sortie, it was obvious to the Government that they would never break out of the city. The Government sacked General Trocju as Governor of Paris on January 22nd (although he remained President of the Republic) and replaced him with the elderly General Vinoy, although Jules Favre held real control. A small revolutionary uprising on January 23rd was crushed with force by the Government of National Defence, further infuriating the population of Paris. On January 28, 1871, Paris surrendered. Favre, on behalf of the Government of National Defense, and Bismarck signed a Convention on the Armistice and the Capitulation of Paris. The negotiations had guaranteed national elections to create a new French government, and on February 8th French citizens (except those in the occupied Prussian territories) voted for a new government. The elections returned an overwhelming number of conservative, middle-class, rural Deputies, who set up a new seat of government at the palace of Versailles. The new National Assembly elected Adolphe Thiers as head of the government, who took over the position of President of France from General Trochu on February 13th. The new government passed a variety of laws which deeply angered Parisians, leading to the outbreak of revolutions in French cities, and the creation of the Paris Commune. The Third Republic (1870-1940) was proclaimed after Napoleon III was captured by the Prussians. After the bloody suppression of the Commune of Paris (1871) by the right-wing provisional government under Adolphe Thiers, Marshal MacMahon, a royalist sympathizer, was elected president (1873). But for the intransigence of Henri, comte de Chambord (the legitimist pretender), France might again have become a monarchy. A republican constitution was finally adopted in 1875. As the various parties combined, separated, and recombined into political blocs, new cabinets followed in quick succession. The 1880s witnessed the expansion of railroads and public education; the latter revived the age-old quarrel in France between church and state. In 1905, after other issues had been added to the dispute, church and state were separated by law. After the rapid rise and fall (1888-89) of General Boulanger, the stability of France was once more shaken by the Dreyfus Affair (begun 1894), which discredited monarchists and reactionaries and brought anticlerical, moderate leftists to power. Socialism, led by Guesde and Jaurès, was now a major political force but was weakened by internal dissensions. In foreign policy the years before 1914 were marked by continued colonial expansion in Africa (Morocco, Tunisia, West Africa, Madagascar) and Indochina, bringing conflict with Great Britain (Fashoda Incident) and with Germany (Morocco). Eventually, France, England, and Russia allied themselves to balance the German-Austrian-Italian combination (Triple Alliance, Triple Entente). In World War I, France bore the brunt of the ground fighting in the west. Clemenceau was France’s outstanding leader. At the Treaty of Versailles in Paris Peace Conference France obtained heavy German reparations and the right to occupy the left bank of the Rhine for 15 years. When reparations payments were defaulted, France occupied the Ruhr (1923-25). World War I severely undermined the French franc's strength, as war expenditure, inflation and postwar reconstruction financed partly through the printing of ever more money reduced the franc's purchasing power by 70 per cent from 1915 to 1920 and a further 43 per cent from 1922 to 1926. After a brief return to the gold standard (1928 to 1936) the currency was allowed to resume its slide, until it was worth in 1959 less than a fortieth of its 1936 value. After Blum’s fall, Édouard Daladier assented to the appeasement policy toward Nazi Germany, Fascist Italy, and Spain favored by Britain and made France a party to the Munich Pact (1938). After the outbreak (1939) of World War II he was replaced by Paul Reynaud. In May-June, 1940, France was defeated by Germany. Marshal Pétain became head of the Vichy government of unoccupied France (other Vichy leaders were Laval and Darlan), which became a German tool. 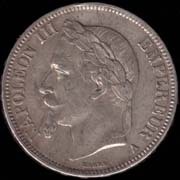 During the occupation of France, the franc was a satellite currency of the reichsmark. 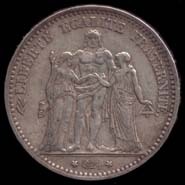 The coins were changed, with the words "travail, famille, patrie" (work, family, fatherland) replacing the Republican triad "Liberté, Égalité, Fraternité" (Freedom Equality Brotherhood) and the symbol of the Vichy regime added. Upon the liberation of France, American troops brought 2FF coins, minted in Philadelphia, in order to return the franc to circulation. Charles de Gaulle proclaimed, from London, the continued resistance of the “Free French”. The Allied invasion (Nov., 1942) of North Africa resulted (1943) in the establishment of a provisional Free French government at Algiers and in the complete German occupation of metropolitan France. De Gaulle’s government moved to Paris after the city was liberated (Aug., 1944). By the end of 1944 the Allies, with heroic aid from the French resistance, had expelled the Germans from France. German occupation had been costly and oppressive. Thousands had been executed and hundreds of thousands made slave laborers in Germany. The liberation campaign itself caused much destruction. Although reduced in power and prestige, France became one of the five great powers in the United Nations and shared in the occupation of Germany. De Gaulle became provisional president. The Provisional Government of the French Republic was an interim government which governed France from 1944 to 1946. Following the Battle of France in 1940 the puppet state of Vichy France had been established under of the rule of Philippe Pétain. However after Operation Overlord, the liberation of Paris and the fall of the Chambois pocket, the Vichy regime was dissolved. Jurisdiction was then handed over to the Provisional Government under the leadership of Charles de Gaulle and other survivors of the French Resistance. The Fourth Republic was officially proclaimed in 1946; the new constitution reorganized the empire as the French Union and was otherwise quite similar to that of the Third Republic. In the immediate postwar years the Communists, notably Maurice Thorez, a major figure in the PCF and a fixture in government throughout the Fourth Republic and into the Fifth, the moderate Mouvement Républicain Populaire, founded by Georges Bidault, and the Socialists were the strongest of the many political parties; the pattern of short-lived coalitions reappeared. Banks and major industries were nationalized. American aid of the Marshall Plan helped rebuild the shattered economy. To further economic recovery and begin the political integration of Europe, France participated in creating the institutions of what has become the European Union, most notably the European Economic Community (Common Market). French military resources were committed to the West by joining the North Atlantic Treaty Organization (NATO). France sent thousands of soldiers to Indochina in an attempt to defeat the nationalist-Communist movement led by the Vietnamese Ho Chi Minh. The effort collapsed with the French defeat at Dienbienphu (May, 1954). Pierre Mendès-France came to power, determined to end French involvement. French withdrawal from Indochina was agreed upon at the Geneva Conference. Subsequently Morocco and Tunisia also achieved independence. But the war for independence in Algeria destroyed the Fourth Republic. When a right-wing French military coup in Algeria (1958) threatened to spread to metropolitan France, de Gaulle was invited back to power. De Gaulle established the Fifth Republic and became its first president in Dec., 1958. The French Union was transformed into the French Community, and most of France’s African holdings became independent by 1960. Algerian independence was negotiated despite a terrorist campaign by the Secret Army Organization (OAS) of extremist French soldiers. De Gaulle aimed at restoring France’s prestige in world affairs. France became a nuclear power (1960). In January 1960 the French franc was revalued at 100 existing francs. 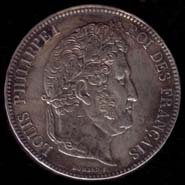 Old franc pieces continued to circulate as centimes (none of which were minted for the first two years), 100 of them making a nouveau franc (the abbreviation NF was used for some time). Inflation continued to erode the currency's value but at a greatly reduced rate comparable to other countries, so when the euro replaced the franc in January 1, 1999, the new franc was worth less than an eighth of its original value. In recent decades, France's reconciliation and cooperation with Germany have proved central to the political and economic integration of the evolving European Union, including the introduction of the euro in January 1999. France has been at the forefront of European Union member states seeking to exploit the momentum of monetary union to create a more unified and capable European Union based political, defense and security apparatus.